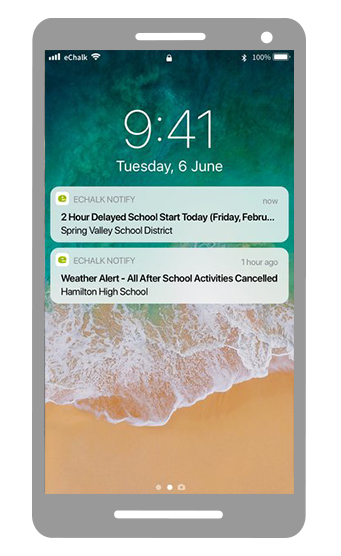 eChalk Notify is a mobile notification system that is seamlessly integrated with your school website, so keeping everyone up-to-date is easy. Students and Families Get emergency alerts, school and district announcement and events, class news, assignment due dates, sports and extracurricular schedules, PTA announcements and more delivered straight to your iOS or Android device. Teachers and Staff Stay connected to PLCs, departments, HR news, staff events, and critical school and district announcements. Put your critical message where everyone will see it immediately—on the lock screen of their mobile phone. 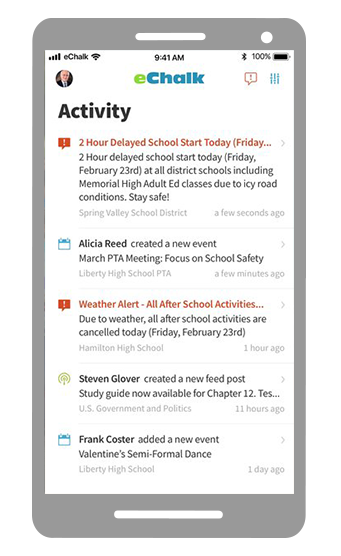 Students, families, staff and community members simply download the Notify app for instant access to critical school and district announcements such as school closings, lockdowns and early dismissals. Licensed users receive personalized updates from their classes, teams, clubs, or departments in the Notify app. It's the easiest way for teachers, coaches, department chairs and group leaders to keep their members informed of the latest news and events. Notify has significant advantages over traditional mass notification systems, legacy mobile apps and standalone text messaging systems. Integrated One step posts information to your website AND pushes it to student, parent and teacher mobile devices. No need for multiple systems. Personalized Students, teachers and parents receive mobile notification ONLY for the school, classes and groups they're part of. Less overwhelming for everyone. Decentralized Teachers, coaches and department chairs can push mobile notifications directly to their members. Better information flow and less work for webmasters.